This is book 3 of the Remembrance of Earth's Past series. This book worked for me. This whole series worked for me. In a way I really wasn't expecting it to work. 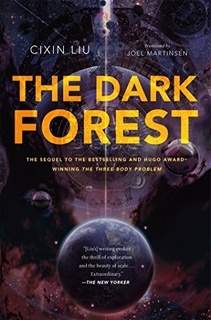 I enjoyed the science fiction, space opera, weird tech elements of the book. I found several aspects of the book difficult, the parts where civilization falls apart and all. Two parts really stuck with me. The first was that Cheng Xin completely and totally doomed humankind in its entirety. The second was the portrayal of the rich of the rich of humanity's reaction as Xin flew off. The latter I have quoted somewhere in here. As many other people have, I enjoyed the series after I was able to get into it. It wasn't what I expected, and that was part of the delight. I recommend the series to any science fiction fan. A new technology can transform society, but when the technology is in its infancy, very few people can see its full potential. For example, when the computer was first invented, it was merely a tool for increasing efficiency, and some thought five computers would be enough for the entire world. Artificial hibernation was the same. Before it was a reality, people just thought it would provide an opportunity for patients with terminal illnesses to seek a cure in the future. If they thought further, it would appear to be useful for interstellar voyages. But as soon as it became real, if one examined it through the lens of sociology, one could see that it would completely change the face of human civilization. All this was based on a single idea: Tomorrow will be better. Book 2 of the Remembrance of Earth's Past series. Okay, book two of the series, this book was not like the previous book. The previous book was a nominally self-contained book with some crazy, but ultimately believable, advanced technology. This book sorta veers sideways into, ummmmm, okay, yes, I guess, more of the person side of things. In Chapter 41, there's a part where a bunch of military guys, full of confidence on how they are going to crush their enemy, start jockeying for position on who will attack first and where everyone else will be, because at this point, it is all about their place in military history. The fleet is then promptly and completely destroyed. The descriptions of the jockeying reminded me of the war games that the US played in the Mediterranean a decade and a half ago (found it, the Millennium Challenge 2002), where "oh, you must follow this script" instead of learning from the non-conventional war tactics that the underdog could and absolutely would use, were dismissed. Like a combatant would follow a script. Uh... no. That said, still a good book, still a good series, still a, oh boy, satisfying read. Going to read the next one, most definitely. It felt no sense of towering above its surroundings, because it had no fear of falling. It had been blown off of places higher than this many times without any injury. Without the fear of heights, there can be no appreciation for the beauty of high places. Book 1 of the Remembrance of Earth's Past series. I have lost my quotes for this book. I don't know where they are, and I find that a little offputting about my processes, because this book has some seriously good ideas when thinking about people, the human condition, and how we treat each other. Imagine, for example, living through the blood bath of a war or revolution, or worse, a "cultural revolution" where anyone who is capable of thinking is killed off in favor of those incapable of thinking but GREAT at the herd mentality. Come to think of it, we haven't progressed much past that point, and didn't learn much from that event, did we? Anyway, imagine living through that and coming out on the other side hating people so much for the death of your parent that when faced with the choice of humanity or another species all together, you choose the destruction of mankind. I think that imagining might have been a spoiler. I'm not sure. This book was not what I was expecting it to be, and it was glorious. 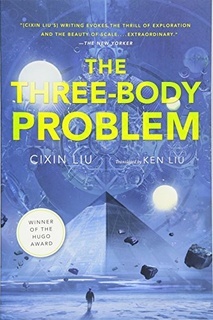 The reading was a little slow to start, I suspect because I was trying to figure out the physics and the ramifications of the changes to the fundamental laws, but reading slightly faster made the book enjoyable and the slower parts fine, because they weren't THAT much slower. 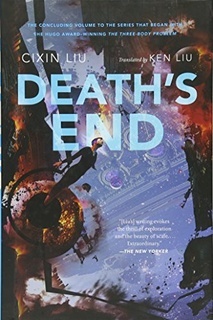 This is the first Chinese sci-fi I've read. When I mentioned the basics of the plot to a friend of Chinese descent, without telling him the book was Chinese in origin, he laughed at it and said, "That sounds Chinese!" When I revealed it actually was Chinese, he added the book to his list to read. So, yes, accurately Chinese, and delightfully sci-fi. I enjoyed the book and look forward to the next book in the series.